Kuncklehead came to my attention when it was on the longlist for Canada Reads this year. There weren't a lot of books that caught my attention, but this one had mystery associated with it, so I decided to give it a try. Ashley Rosco is a small town Ontario young guy, going no where. He's bouncing at the local club, working out and competing in body building. He's in love with his best friend's girl who also happens to be his cousin. Yeah, things get a bit icky here because they fool around too. And yet, I liked Ashley and hoped he could get his life together. His family is messed up and Ash has his own issues. He's that young guy with no ambitions, just hanging out with his old life, doing drugs, on the edge of society, but senses that he could be doing better. The mystery is when his cousin, Chastity, goes missing. He gets a bit obsessed, and the story he narrates goes back in forth, growing up times, present time, and times with Chastity. His friend Darren is definitely heading in a dangerous direction with his really bad news father. Things get pretty gritty - guns and drugs and fights. Somewhere around half way through I really got into the story, and the mystery of Chas started ramping up. Certainly not a book I would have ever found myself or picked up, but I ended up liking it quite a lot. 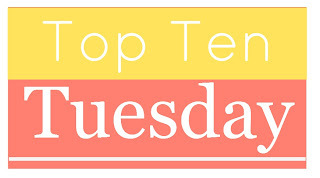 Top Ten Tuesday is hosted at The Broke and the Bookish each week. The topic this week is Top Ten Most Anticipated Books For The Second Half of 2017. I have lots of books already to read, so most of the books I'm anticipating are from tried and true series. I'm looking forward to seeing what books other people are looking forward to. I'm actually one behind here, so once I get The Queen's Accomplice read, this one will be out. I'm waiting for the library to get the latest Chevalier book in. It is part of the Hogarth Shakespeare retelling series. It has been released, but fairly recently and I'm waiting. Chevalier is one of my reliable authors, but this is her first non historical novel. I read the introduction which told how, because it was isolated, books survived in Ireland that were destroyed in Europe after the fall of the Roman Empire in the early centuries AD and then spread Christianity during the Dark Ages. That's the main point and after reading the rest of the book, I don't know a whole lot more than that. There's a nice background on Saint Patrick and I have increased my still slight knowledge of the Dark Ages. This idea of picking a crazy idea and then writing a book seems to have reached its nadir here. It started with a secular, not very religious guy wondering what to teach his son about religion, and then he decides to live the Bible, Old Testament, for a year. There is some humour and you can tell he is writing this to be a book. I guess I see a difference between doing something, and then writing about it after, versus deciding to write a book about something and then chronicling it as you go. There is a level of artificiality to this, like a reality show that follows famous people on their very contrived adventures. A lot of the tasks seem to be doing them just to do them, or finding loopholes to do a different version of things. However, he treats the people he talks to with respect, and his effort at prayer and meditation were getting somewhere. His wife was a saint throughout this. A saint. I previously listened to Pollen's In Defense of Food: An Eater's Manifesto and only found it okay. This was the last of last summer's YA Sync I listened to and it was very similar to In Defense of Food. Pollen makes good points, and he doesn't say anything is good or bad, just presents the different facts. It really is a dilemma! There is a level of judgement though and I find myself arguing what ever point he is making as I listen. I feel bad not liking this book because it is written by a thirteen year old with autism, sharing his experiences and reasons why he does the things he does. It is written as a somewhat guide to dealing with kids with autism with Naoki wrting questions and then answering them based on his experience. I felt there was too much generalizations as I can't imagine that every autistic child is experiencing the world the same way he does. However, I imagine that even seeing his explanation of why things happen they way they do could be insightful. There were some very beautiful sketches between chapters. I haven't seen Hidden Figures or read that book, but I would imagine the same basic information is covered. I'll have to try Hidden Figures to compare. Starting in the 1930s and the rise of rocket technology, The Rise of the Rocket Girls follows the roles that women played in JPL (Jet Propulsion Labs) as they develop rockets for NASA. Women who were strong in math (yay for women in math!) were hired as computers, to do the calculations. Overall, this was a decent read and showing the contribution of women to science in space technology. Somewhere along the internet, I heard great things about Jess Walter. His books were often on the 'Best Of' lists at the end of the year. I confess, I'm easily influenced by book lists. Unfortunately, some of the books that get listed for awards or Best Of' leave me bored. I'm particularly thinking of Michael Coetzee. Sometimes the themes and writing style that literary critics like is not what I particularly like. So I was surprised to buy my second book by Walter without having read the first. Risky! Lucky to report, I quite liked Walter's style and both books I've read this year. 1980s, a week before the presidential election between Carter and Reagan, and Vince Camden, donut maker and small time crook, gets a registered voter's card. This might not seem a big deal, but it is for Vince, who is in the Witness Protection Plan, and was a felon. Vince is trying to live a 'regular' life but finds it a little dull. When he notices someone in Spokane that he recognizes from his former life, life stops being quite so dull. Walter's writing is so much plot and characters, but the writing is also solid, making me feel I'm reading more than just a genre mystery fiction book. As well, there is a humour present in the descriptions, as well as a crime noir feel. I feel the higher level of writing, but it doesn't overwhelm me or intimidate/bore me with descriptions or themes. Walter accomplishes a lot in this book, especially keeping me entertained. This was probably the book that made me notice Walter, a lot because, how gorgeous is that cover? A little village in Italy - divine. Many strands in this book - I saw it described as 'braided narrative' at Tournament of Books, keep the pages turning. In 1962 a young American actress takes a break from filming Anthony and Cleopatra in Rome (and yes, Richard Burton makes a cameo later in the book) and arrives at the most out of the way village in Italy, to stay at the Hotel of Adequate View. ha! Also, present day Hollywood with an old producer guy. And rural Montana with a semi rock star. And a story within a story written from the same village by an American army guy. Some stories work better than others, but the plot strands kept me interested. Trying to see how the people were connected is always the best part of braided narratives. I liked this one, it was different than many books I read, and I'd read more books by Jess Walter. Every now and then I like a good paperback suspense read and Linwood Barclay is who I turn to. His books, previously I've read Fear the Worst, Too Close to Home, and No Time for Goodbye, are all the same with twisty, tight plots and realistic characters. His writing is very good, with little extra prose; I never feel like this could have been shorter. These would be excellent beach or travel books. Here we have a private investigator from upstate New York dealing with the death of his teenage son from drug use/suicide. One night Cal picks up a girl who is looking for a drive and recognizes him as Scott's dad and while he knows it is not a good idea to drive a young girl, he wants to talk about Scott and maybe get new information. Things go weird with Claire and thus sets us off on the hunt for Claire. Cal is related to the police chief, and Claire is the mayor's daughter so everything is related. And that's the end of my informatioin because Barclay's books are all about the revelations and the search for answers. I would always pick up a Barclay book at a book sale or from the library and know that I am getting a great suspense book! Sue Klebold writes a very difficult book, putting herself and her family under the microscope and open to much judgement. Klebold is the mother of Dylan Klebold, half of the duo who perpetrated the Columbine killings. I was feeling rather judgey at the beginning of the book, because until she explains more of what happens, nearly everyone's reaction, including mine, is to wonder how this could happen in her house without her knowing. But I should have realized it is possible: ultimately, no one ever really knows any other person. You can never say 'He or she would never do that," because no one can ever know. This book really solidifies this idea. Part of the book details Dylan's life growing up which seemed pretty normal. Nothing stands out and after the fact, in any family, things may have happened that you could look at. Klebold is brutally honest, but who knows what got left out? Part of the book deals with the aftermath, as they were grieving their son's death, but were not permitted to be a part of the community's losses. Easy to see both sides of that situation. I was struck by the outpouring of support from across the country the Klebolds got and I was impressed with the people who recognized their loss. Very generous in the wake of such horror. There seems to be consensus that Dylan and Eric Harris were suffering from different mental issues. Dylan was suicidal depressive while Eric was homicidal psychopath - bad mix together. Klebold missed that Dylan was depressed. I found this very timely, as a previous student of mine had committed suicide just the week before I read this book. Nobody realized he was depressed. I appreciated the background and research into suicide that Klebold provided in the book. The role the school and the school culture played was significant. As teachers, we get to see a different side to students that parents may not, and therefore we can play a role in helping and preventing tragedies. She includes some interviews with people who were not surprised that someone at Columbine snapped which forces a discussion of school culture. This is a difficult book to read. Klebold toes a fine line between helping to examine what led to her son murdering people and the child she thought she knew. Accepting some blame but not knowing what she could have changed. Dealing with her own grief and guilt. Hopefully it contributes to the mental health discussion. What makes a person a success? Hard work and pluck? Malcolm Gladwell takes his 'anecdotes to explain theories' book concept to examine success. What makes these outliers work? I feel I've read this before although I know I haven't. Some of the ideas from the book have already become ingrained in our collective understanding of success. For example, Gladwell examines the role that birth month has on successful hockey players. We now realize that players born in January, February and March are much more likely to make it to the NHL. They are just that much older and bigger in the beginning of minor hockey when 7 and 8 year olds begin to play. Their slight age advantage makes them stand out, and get picked for travelling teams. They get better coaching and more practice and thus progress faster. And suddenly, it's not necessarily hard work and natural talent that gets you to the NHL - being born in January is an automatic advantage. I am also already familiar with the 10,000 hours idea - that it takes at least 10,000 hours of practice of anything to become an expert. That's why overnight successes are never that, the hours of practice have been put in. Did you know that of the biggest names in computer technology - Bill Gates and Steve Jobs and some other technology icons were born within eight months of each other. They were in the right spot at the right time to become interested and have the ability to work with computers at the same time. Other examples he covers in this book related to the culture you are born into include: why Asians are better in math, why South Korean airlines had so many accidents in the 90s, how feud fights in Eastern Kentucky and a culture of honour also seen in the southern states relate back to a Scottish/Irish shepherding background. It's all quite fascinating! I can see how this book led to his book David and Goliath, and maybe even includes leftover research. They cover the same theme: success is not based on what you think it might be. Success is more to do with luck of location or hereditary, and what we perceive as a disadvantage may not actually be one. Gladwell narrates his own books and he has a good style. His books are so interesting and he covers so many ideas, I could easily re-listen to any of his books again and still feel like I am learning new things. Sara Jewell writes 'Field Notes' for her local paper in Cumberland County, Nova Scotia. This book is a collection of her essays and articles put together chronicling her adjusting to life in rural Nova Scotia after moving from Vancouver. Jewell feels she has always been a rural girl who never happened to live in a rural area, having grown up in Ontario. She had spent some summers in the Pugwash area growing up, and her parents had a cottage there. So when she is suddenly getting a divorce, her first reaction is to leave Vancouver and head to Pugwash and her parent's cottage. The essays are short but so well-written. Jewell's love of her new life, and appreciation for nature and small town life shines through. After a few years, she meets a local boy and they get married. I thought the book would be a linear narrative of her life after she moves to NS, but once I realized it was previously written essays, I was good and just loved the book. I read a few chapters each day to extend out the enjoyment of these lovely views of life. Jewell's voice is strong and by the end, I felt like I knew her and if I was in Pugwash area, we could get together for a coffee and chat. I'm not sure how available this book is across Canada. I bought it while in Nova Scotia at a Chapters and I'm sure you could order it online. It is also available at my local Indigo in the 'Local Interests' area. Cumberland County is just across the Northumberland Strait from PEI and I was familiar with some of the areas making this more personal for me. I loved the sketches on the cover and the only thing that would have made this book better would have been including the sketches throughout the book. Jewell's blog looks like an extension of the essays that were combined in the book, so if you want a little taste of Field Notes, check it out. In 1915, a Toronto man coming home was shot as he entered the front door. That is was a young 18 year old maid, Carrie Davis, who shot prominent Bert Massey, of the Massey family, made this story sensational, and historical writer Charlotte Gray tells the tale. Actually, there isn't a ton to the crime story. The whole incident, from shot fired to end of trial took only a few months and was fairly unremarkable. But Gray does more than tell the story of the trial. Instead, I read about a young country Canada about to come into her own as a nation fighting in WW1, the beginning of the end of the class system in Toronto, the crazy newspaper wars that were occurring, women fighting for rights, immigrant life in Toronto, and some background on a well-known rich Canadian family the Masseys. (I assume this became Massey-Ferguson farm equipment, not to mention Massey Hall) This was a great history book of Canada in the early 1900s, using a crime as the backdrop and to give some real people to anchor to the story. Gray does excellent research, and I liked her narrative style. The background of many of the characters, including the defense lawyer Harley Dewart, the judge, the whole Massey family, and some of the women fighting for votes and better life for women. Gray even manages to reuse some of her previous research, as she quotes Nellie McClung, a book I read in 2010 about the Canadian feminist pioneer. That's okay because everyone needs to hear about Nellie more often! This is what history is meant to be and how it is supposed to be taught in school - events happen within a social context and it is necessary to investigate any event, like a random little crime, looking at how life was and what else was going on socially, economically, and politically.